Cycle over off-road, wooded trails in the jungles of Bali and take a tour of quaint hamlets, ancient temples and rice fields of countryside Bali. Beginning in the shadows of Mt. Batur, you'll cycle over rising trails, through plantations of exotic fruits and spices, stopping briefly to taste some of produce. You'll be accompanied by an expert tour guide who'll introduce you to the culture and history of the island community, with popular tales and stories. After an exhilarating ride of 3-4 hrs with brief intervals to rest, you'll end the tour at the Koko Bambu Restaurant, where you'll have delicious lunch. Before the day is over, you'll also take a tour of the nearby Mason Gourmet Chocolate Factory. Your mountain cycling adventure begins near the volcano of Mt. Batur, overlooking the Kintamani Lake. 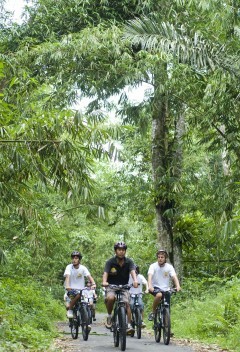 The route will take you over off-beat trails in the lush green forests of bamboo and large farmlands of paddy rice. As you cycle for 25-30 kms in the Balinese highlands, you'll make frequent stops at vantage points to admire views of the island, at temples and villages to view the architecture, ending the tour at the Koko Bambu Restaurant. 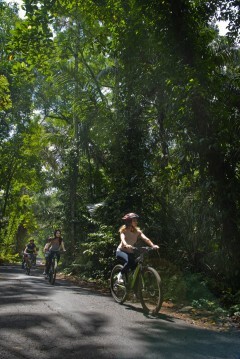 • Go cycling in the dense forests of Bali. • Take a tour of plantations, fields and villages of Bali. • Get photogenic views of Mt. Batur and the highlands. • Learn about Bali's rich history and culture. Consumption of alcohol, drugs or tobacco products like cigarettes is strictly prohibited during the trip. Travellers are required to follow instructions of the tour leader during the trip. 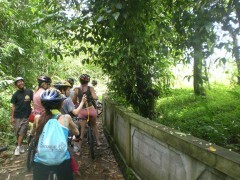 For cancellations made more than 2 days before scheduled date of the Bali mountain cycling trip: 90% refund. For cancellations made 2 days or less before scheduled date of the Bali mountain cycling trip: no refund. You'll be picked-up from your hotel in Bali by 7:00-7:30 hrs from Nusa Dua, 7:00-7:30 hrs from Kuta/Seminyak, 7:30-8:00 hrs from Sanur and 8:15-8:45 hrs from Ubud. Timings are approximate and subject to delays. Bookings for children aged 10-12 years are charged at a discounted price of INR 3,300 per person. Bookings for children older than 12 years are charged at full price. 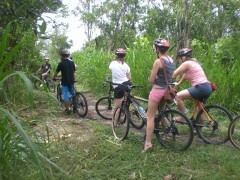 Go mountain cycling in Bali! Early in the morning, you'll be picked-up from your hotel a private vehicle. You'll travel to the start point of your cycling adventure, near the Mt. Batur volcano, overlooking the Kitamani Lake. Here, you'll test ride your cycles and set off over off-road, wooded trails for a tour of quaint hamlets, ancient temples and rice fields. 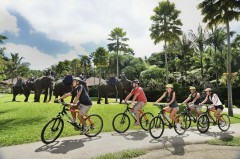 Accompanied by other cyclists and an expert guide, you'll hear tales of culture and history as you cycle across plantations of exotic fruits and spices, stopping briefly to sample some of the produce. Your tour ends at the Koko Bambu Restaurant, where you'll have delicious lunch. Post lunch, you'll visit a nearby gourmet chocolate factory. Soon, you'll board the private vehicle and return to your hotel by 16:00 hrs. 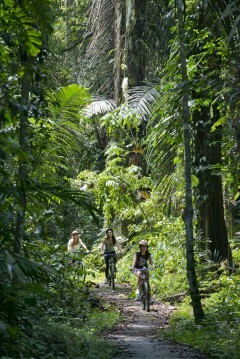 Explore trails and routes in the dense forests of Bali. All equipment required for cycling: mountain cycles, helmets etc. Today's meal package includes lunch at the Koko Bambu Restaurant. You'll also be given mineral, drinking water during the cycling trip. Free WiFi and refreshing cold towels will also be available at the restaurant. 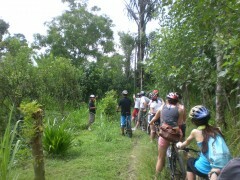 The tour operator will arrange your transport to the start point of the Bali mountain cycling trip.